There was an exchange of words between the Chair of the Standing Committee on Justice, Law and Human Rights, Alvick Maharaj and the National Federation Party delegation in a Parliamentary committee session. The exchange of words was on whether the Fiji Broadcasting Corporation receives grants or fees from the government. The NFP delegation appeared before Standing Committee on Justice, Law and Human Rights to make submissions on the Code of Conduct Bill and highlighted that institutions that are wholly or partly funded by the government should be included in the Code of Conduct Bill. NFP President Pio Tikoduadua used FBC as one of the examples of the institutions that should be accountable as they are given public funds and it should be included in the Bill. The NFP has called for the review of schedule six of the Bill to include Commercial Statutory Authorities and Government Commercial Companies who receive significant funding from government. Officers of Fiji Sugar Corporation and Fiji Broadcasting Corporation Limited. The Chairman of the Committee, Alvick Maharaj then questioned if NFP wanted commercial entities of government which are not funded by government to be included in the Code of Conduct Bill. NFP’s Kamal Iyer then made statements and raised questions about the money that is given by government to FBC. This resulted in an exchange of words with the Chair of the Standing Committee on Justice, Law and Human Rights Alvick Maharaj. 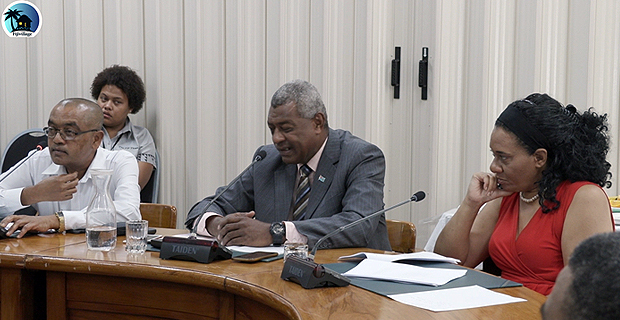 Meanwhile, Committee Member and SODELPA MP, Mosese Bulitavu then said that the issue the NFP is arguing is about the extension of the definition of public official in this Bill.